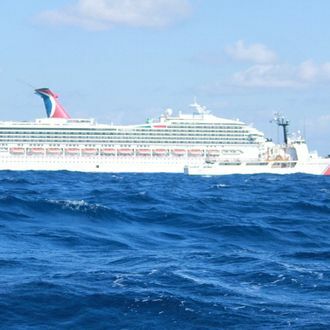 Carnival CEO Gerry Cahill greeted passengers of the crippled, poo-smelling Carnival Triumph, for a personal apology after it finally limped into port in Mobile, Alabama. Of course, if you’ve been watching CNN’s wall-to-wall coverage, you knew that already. At this point, people really just want to get the hell home, but even at the dock it’s not that easy. With only one working elevator, it could take five hours for everyone to get off, the Los Angeles Times reports. So while they were still trapped aboard, Cahill took the opportunity to offer a mea culpa, and $500. Cahill said on Thursday he’d throw in an extra $500 per person in addition to the refund ticket for another cruise passengers already had coming. That’s in addition to the complimentary booze passengers had already received, plus the steak and lobster they got for lunch on Thursday, Reuters reports. On top of all that, “Carnival said it would greet the passengers with warm food, blankets and cell phones.” Plus, they get a free bus ride to Galveston, Texas, or New Orleans. What could these people possibly have to complain about? The way in was also peppered with the mishaps, including the difficult currents, and the tow line that broke. At this point, passengers had better just hope none of those buses break down. That is, if they even get on. As one parent of a passenger told the Associated Press, “If I hit land in Mobile, you’d have a hard time getting me on a bus.” Us too.